Bolivia and Brazil. The type specimen was collected from the Rio Guaporé. It can be difficult to get hold of wild specimens these days, though. Virtually all of the fish entering the trade are produced commercially on farms. Most of the ones on sale in the UK originate from Eastern Europe or the Far East. 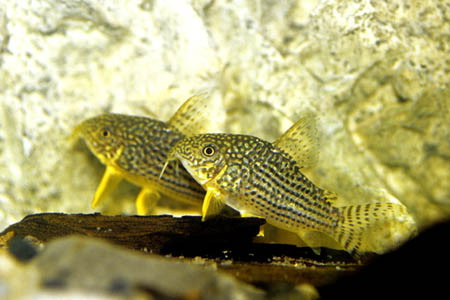 These captive-bred fish are generally more hardy and adaptable than their wild counterparts, having been raised in conditions far removed from their natural habitat. Small tributaries, creeks, pools and areas of flooded forest. C. sterbai will thrive in a tank set up to replicate an Amazon biotope. This would be very simple to arrange. Use a substrate of river sand and add a few driftwood branches (if you can’t find driftwood of the desired shape, common beech is safe to use if thoroughly dried and stripped of bark) and twisted roots. A few handfuls of dried leaves (again beech can be used, or oak leaves are also suitable) would complete the natural feel. Aquatic plants are not a feature of this species‘ natural waters. Allow the wood and leaves to stain the water the colour of weak tea, removing old leaves and replacing them every few weeks so they don’t rot and foul the water. A small net bag filled with aquarium-safe peat can be added to the filter to aid in the simulation of black water conditions. Use fairly dim lighting. Alternatively, it also does well in a more standard, preferably well-planted tank. A good maintenance regime is essential with this species as it’s sensitive to deteriorating water conditions. 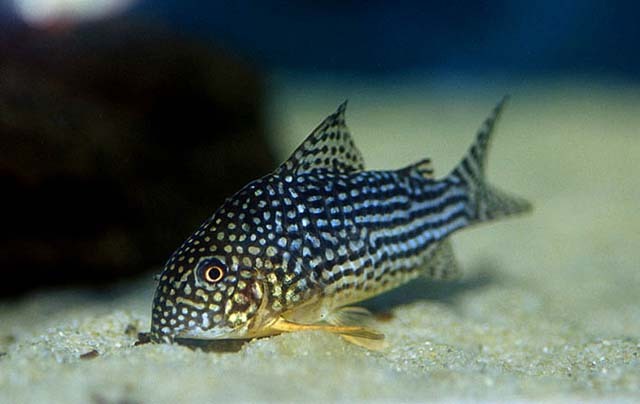 As with all corys, don’t use undergravel filtration and ensure the substrate is kept scrupulously clean. 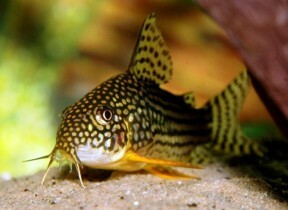 These cats are sensitive to poorly-maintained or dirty substrates and can lose their barbels if kept in poor conditions. 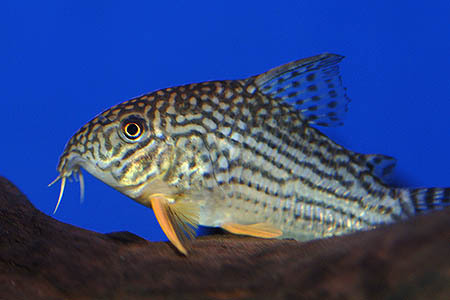 Generally considered one of the easiest Corydoras tp spawn and a good choice for the beginner. Most corys are primarily benthic (bottom dwelling), although a handful of exceptions do spend the majority of their time in open water. Unfortunately this behaviour often means that they’re purchased and sold as scavengers that will “clean the bottom” of your community tank. While they’ll certainly polish off any uneaten morsels that reach the substrate, they won’t keep the substrate “clean” as such. In fact maintenance of the substrate becomes more of a primary concern if your tank contains a few corys, as they can develop nasty infections of the barbels if kept in dirty or otherwise unfavourable conditions. It should also be said that they won’t do well if expected to survive on the scraps of food that escape the fish above. Always use sinking varieties to ensure your corys receive the right amount of food. This popular, attractive species is superficially similar to C. haraldschultzi, but can be distinguished by examining the patterning on the head of the fish in question. In C. sterbai this is composed of light spotted markings over a dark background, whereas in C. haraldschultzi the markings are dark and the background colour light. 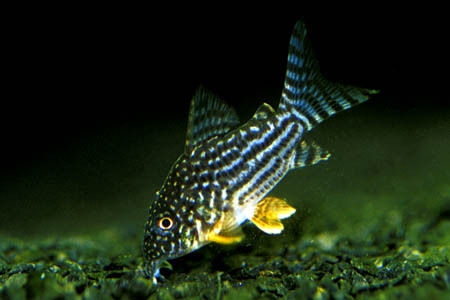 C. haraldschultzi also has a more elongated snout. In recent years a commercially-produced albino form has become available and achieved a fair degree of popularity in the hobby. I have two of these, both young non-sexed. 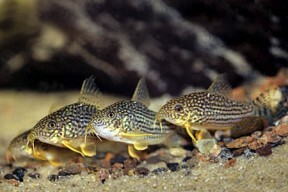 I belong to a local fish club, and we’re growing them out, as a contest to see whos reproduce, the biggest etc. I do like them, and they are a pretty fish that will stay small for the smaller tanks. They are a gentle fish, non agressive. I’m fairly new to the “fish” scene, with an 11 gallon, and a 55 gallon tank.